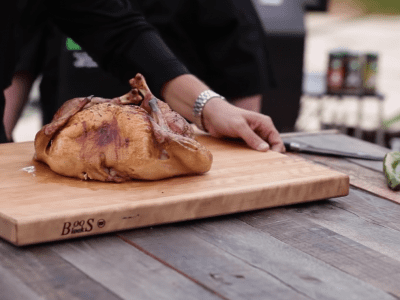 Sterling Smith from Loot ‘N Booty BBQ and Chef Willie Nelson create a delicious Spatchcock Turkey perfect for your Chrissy Cookup! NOTE: Its always a good idea to brine your turkey before roasting. Prepare butter rub for turkey. Combine softened butter, salt and pepper in a mixing bowl and mix well. NOTE: We recommend adding roasted and peeled green chillies to this rub for an extra kick of flavour. This butter rub will keep the turkey moist and allow the skin to become crispy. Remove the backbone of the turkey by finding the neck-bone area with sears. Cut down the neck bone on one side, before doing the same on the other until the backbone has been removed from the bird. Flip the bird over (breast-up) and press the bird slightly so the breasts break loose and the bird lies flat. Use your hands to break the breast skin away from the meat (without removing it) so that rub can be applied in between the layers. Rub your butter rub inside these layers. Cook the turkey in a smokey 177°C Green Mountain Grill for about 2 to 3 hours, until an internal temperature of 74°C has been reached.